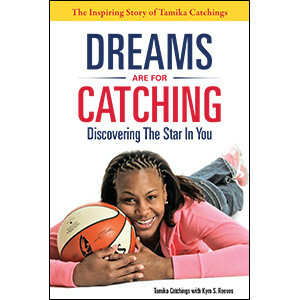 The Inspiring Story of Tamika Catchings. Do you have a dream that seems as far away and impossible to achieve as a star might be to catch? Believe it or not, Tamika Catchings – Academic All Star, high school and collegiate champion, WNBA veteran and oft-named All Star, two-time gold medalist Olympian and much more – has overcome many obstacles to reach her dreams and become the star she is. Like most girls, Tamika had problems growing up. With a speech impediment and family troubles, wearing hearing aids, glasses, and braces, Tamika struggled to find the star within her. Everyone has the potential to reach the stars, to be a winner and a leader. With hard work, dedication and a positive attitude, you can achieve great things in your life. Use the journal exercises throughout this book to help you discover the star within YOU!